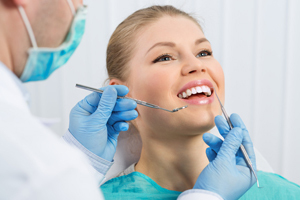 Riverbend Dental Centre provides a number of services for patients in Saskatoon. We offer direct billing to your insurance company so you won’t have to worry about the paperwork. Invisalign® clear aligners are a virtually invisible solution to gradually move your teeth toward the smile you always wanted. We work with patients that have moderate to severe conditions by creating a comfortable solution to fit your lifestyle. Because the aligners are removable, you can continue to eat your favourite foods and brush and floss normally to keep your gums and teeth healthy. Average treatment time is about one year. We help you maintain optimal dental hygiene with our exams, cleanings, brushing with professional electric toothbrush, and fluoride treatments. We use specialized tools to remove all tarter, plaque, and trapped food missed by brushing and flossing. Our hygienists also educate children and adults on proper daily hygiene routines and offer suggestions for improved dental health. If your teeth have become stained yellow by coffee, tea, acidic foods, or genetics, Riverbend Dental Centre offers teeth whitening to lighten your teeth up to three shades. We make custom whitening trays for your upper and lower teeth for you to take home and use until your desired results. We provide you with industrial grade whitening paste that will gradually whiten your teeth in multiple uses. These treatments are safer and more effective than over the counter whitening kits. Our Saskatoon dentist also provides sport and night guards, custom fitted for your teeth, gums, and jaw line. Sport guards offer vital protection in contact sports such as wrestling, football, rugby, and hockey and protection against impact in basketball, volleyball, softball, and other sports. If you grind your teeth while you sleep at night, we have night guards available to keep your teeth apart, avoiding the dulling of the edges of your teeth caused by repeated grinding. Crowns cover teeth that have had root canals, large fillings/restorations, cracks, chips, redecay, or worn down. Crowns help to preserve the teeth from breaking, wearing down and esthetic purposes. Bridges “bridge the gap” created by an extracted tooth, filling in the space with a veneer and supporting the surrounding teeth. Both are available at Riverbend Dental Centre, each custom fitted for your teeth. When there is decay or infection at the base of tooth, a root canal may be necessary. Root canals clean out areas in and around the tooth, removing the nerve to relieve pain. We will determine if you are a good candidate for a root canal and if the process is necessary to remedy your tooth pain. It is common for patients to have impacted wisdom teeth, which crowd the other teeth, can make them crooked, and cause pain and discomfort in the teeth and gums. Riverbend Dental Centre can extract one, multiple or all wisdom teeth. This is done by numbing the mouth. In our office we provide localized freezing to the extraction site. If nitrous (aka “laughing gas”) is required, we can refer you to our affiliate office Sutherland Dental Group for this application. If a general anesthic is required or requested, we will provide a referral to an Oral Surgeon for your procedure. Each tooth is broken into pieces and extracted one piece at a time to decrease pain and bleeding. Recommendations for recovery and follow up care are given after the procedure is completed and required medications if needed are prescribed. When a tooth gets a cavity, fillings are often needed to fill in the hole and stop the spread of decay. Today’s fillings are composed of a clear resin that matches the color of your tooth, a big improvement over the silver fillings and painful drilling of the past. While we do not complete orthodontic and oral surgery procedures, Riverbend Dental Centre does provide referrals to specialists. We are connected to a network of the best industry professionals and will ensure you are in good hands.